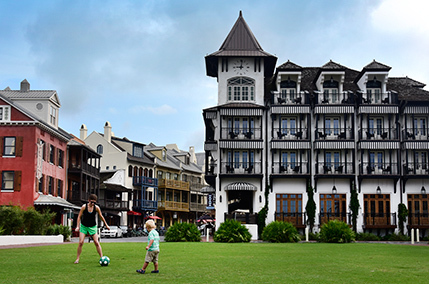 A romantic aura surrounds the New Urbanist community of Rosemary Beach positioned at the easternmost end of Scenic Highway 30A. This 107-acre beach town features dramatic West Indies-inspired architecture in rich earth tones with brick-lined streets and winding wood plank pathways leading to a gorgeous private beach.Designed for a pedestrian lifestyle, bike or walk to the quaint town center complete with coffee shops, upscale boutiques, a gulf side inn and unique restaurants offering a variety of culinary styles. Town amenities include community greens, swimming pools, a fitness center and tennis courts.